Stanbridge College VN students volunteering at public medical camps. On June 30th, Stanbridge College students and staff joined Mariners Outreach Medical & Dental Ministry at the Orange County Free Medical and Dental Clinic & Festival to help provide medical services to the uninsured and needy. Volunteers assisted medical professionals, prepared food and served lunch, distributed donations of clothes and provided entertainment and activities to children. Several of Stanbridge College’s Vocational Nursing students volunteered their time working alongside medical professionals providing medical and dental assistance including vitals, wound care, glucose checks and more. Stanbridge College also provided a donation of wound care supplies to the medical camp. The Orange County Free Medical and Dental Clinic & Festival serves those in the Orange County community who are in need of medical and dental care but with no means of access to these critical services. Between 200 and 300 patients are treated in these clinics each day and are provided with services including vision, dental, women’s healthcare, medical and physical therapy. Stanbridge students were able to see first hand the need for medical services in their local community. This is the second Orange County Free Medical Camp that Stanbridge College volunteers have participated in. Stanbridge College partnership with Mariners Outreach is part of the Stanbridge College REACH – Beyond the Classroom™ Service Learning and Civic Engagement initiative. Stanbridge College REACH encourages students and alumni to give back to their local communities using skills in leadership, critical thinking and compassion. 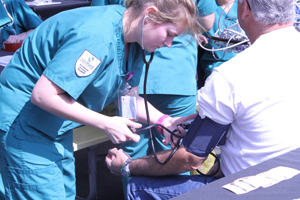 In the past, Stanbridge College nursing students have volunteered in several public medical camps in Southern California. Stanbridge College REACH has also partnered with the County of Orange to set up public flu shot clinics. To learn more about the Mariners Outreach Medical & Dental Ministry please visit www.marinersoutreach.org/med.